If you’re thinking about teaching English in China, then you have come to the right place. EF English First has over 300 schools across 60 cities in China, so you can be sure you’ll find the right city for you. Currently, we have teaching positions available all the way from Beijing in the north, right the way down to Shenzhen in the south. Who teaching English in China is for? Are you a fresh university graduate with no previous teaching experience? EF will support you from day one with the onboarding and training process. Our certified trainers will get you familiar with our in-house created materials and help you to become confident in the classroom. Are you currently a teacher (of English or of any other subject)? EF provides many higher education program opportunities such as sponsoring TKT tests, distance learning courses, CertTESOLs, and DipTESOLs to build your CV and expertise. Are you a professional with 5+ years of industry knowledge under your belt already? EF has a place for you in our schools. About 30% of our teachers were looking for something more fulfilling than the 9-5 work week grind and looked for a new experience through our open EF teaching positions. Join us today! Thinking about teaching English in China, but still aren’t sure if it’s for you? EF classrooms are like nothing you’ve ever experienced before. We have over 300 centers in 60+ locations around China. They are modern and bright spaces, filled with the latest technology. Teachers’ rooms are occupied by international colleagues who you can always exchange stories with and learn from. Best of all, EF’s hallways are bustling with amazing students who are eager to learn the English language. Whether you chose to teach young learners, adults, or online; our classes will have the same award-winning teaching materials and lesson plans prepared by our in-house content creators. After you have successfully completed your interview, received an offer letter, and sent back your signed contract to your recruiter, EF sets you up for success – even before you arrive in China! If you do not have a TEFL certification, don’t worry, we will sponsor your 120-hour online course at no expense to you. This will give you a taster into the world of ESL teaching before you step foot into the classroom. When you arrive and onboard with our training team, we give you a two-week induction into the world of EF and the teaching materials you’ll use in the classroom. We also know you’ll be simultaneously busy apartment hunting and getting settled into your new city, so we have many opportunities throughout the week for you to ask your questions from teacher ambassadors, your recruiters, and your coworkers/line managers in your center. Fast forward a month or two after touching down in China; EF has continuous opportunities for professional development from free Teacher Knowledge Test (TKT) modules, Trinity-accredited courses (CertTESOL and DipTESOL), and in-center best practice sharing from your colleagues to help you be the best teacher you can be. Teach English at our kids & teens schools, adult centers or at our online facility. Our schools are filled with the resources you need to be a great teacher. From internet-connected classrooms to lesson planning materials, you’ll be set from day one. Are you ready for the job of a life time? ESL jobs are unlike any professional experience. While your work hours and location might be unusual, you’ll be able to travel on weekends to exotic locations and learn a new language while teaching students who are engaged and active participants. Taking a job teaching in China gives you the best of both worlds – a strong career and an adventure. The types of teaching jobs available can vary, but at EF we make sure our teachers get exactly what they need. Whether it’s a five-year professional growth track or a job to allow exploring another corner of the world, teaching English in China with EF makes life easy and worthwhile. Living in China is like living anywhere else in the world. 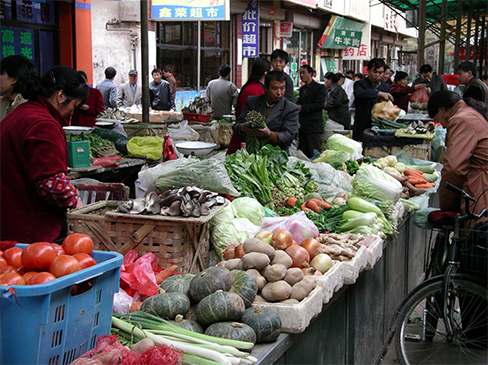 Many items are cheap, especially when shopping at local markets and eating out at neighbourhood restaurants. Still, our teachers find there’s always time (and pocket change) to live a bit more extravagantly than usual. Weekly massages, monthly trips and saving money are all possible on an English teacher’s salary.